Just as when he brought his Bayern Munich team here, he will be afforded a hero’s welcome. Guardiola will forever be intrinsically linked to Barcelona, to Catalonia. He grew up in Santpedor, a close-knit medieval town up in the hills, a couple of hours north of the city, all terra-cotta houses and unlocked doors. His parents remain there. They speak Catalan, rather than Spanish, as a first language. One of his sisters works for the Catalan regional government. It was at Barcelona, too, where Guardiola made his name as a player, and where, as a debutant coach, he nurtured one of the greatest teams in history, winning the Champions League twice, the Spanish title three times. He did it all in Barcelona’s signature style, too, the one he learned as a player under Johan Cruyff and later summarized as: “I take the ball, I give the ball, I take the ball, I give the ball.” Barcelona reveres Guardiola because, by birth and by inclination, he is one of its own. 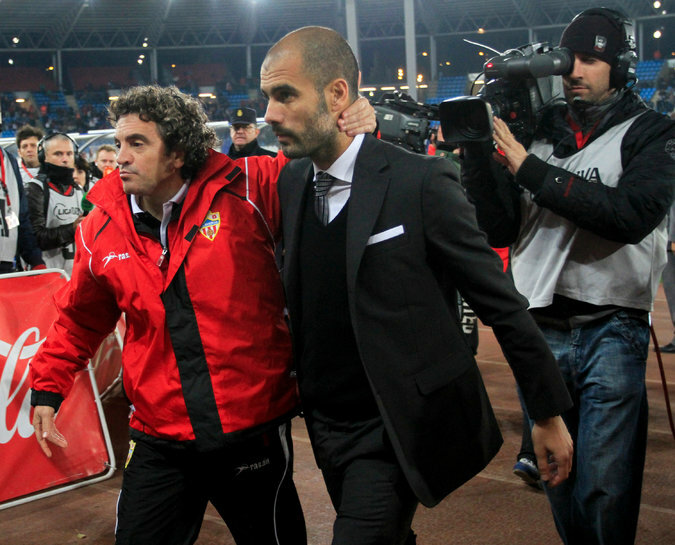 Juan Manuel Lillo, left, with Pep Guardiola in 2010. Lillo coached Guardiola at the Mexican club Dorados de Sinaloa 10 years ago.